Best Video Of The Day? MIT's 3-D Remote 'Touching' Device : The Two-Way Imagine being able to be in one place and use your hands to move something somewhere else as if you were in that remote room. Other possibilities abound. Watch and wonder. It's tempting to say this is the coolest video we've seen so far this year, but a joke like that might make it sound like we're not serious. Really, there is something about this that strikes as amazing. The Tangible Media Group at the MIT Media Lab calls its invention a "tangible user interface." What it does, The Associated Press writes, is allow a person in one location to move an object somewhere. The "inFORM system," according to the MIT Technology Review, "facilitates the real-time movement of physical 'pixels' on a table surface that move in accordance with data from a Kinect motion sensing input device." The AP says a "depth-sensing camera" sends signals from the remote location to the "motorized pin screen" where something can then be manipulated. The man on the screen isn't really there. But the flashlight he's moving around is. You can see for yourself in the video what kind of things can be done already. ITProPortal suggests that "an inForm device the size of a dinner table ... could show moving faces, models of buildings for use in architectural design, or let you play real games such as mini golf." The Tangible Media Group is exploring several potential uses involving "maps, GIS [geographic information systems], terrain models and architectural models. Urban planners and Architects can view 3D designs physically and better understand, share and discuss their designs. ... We would like to explore medical or surgical simulations. 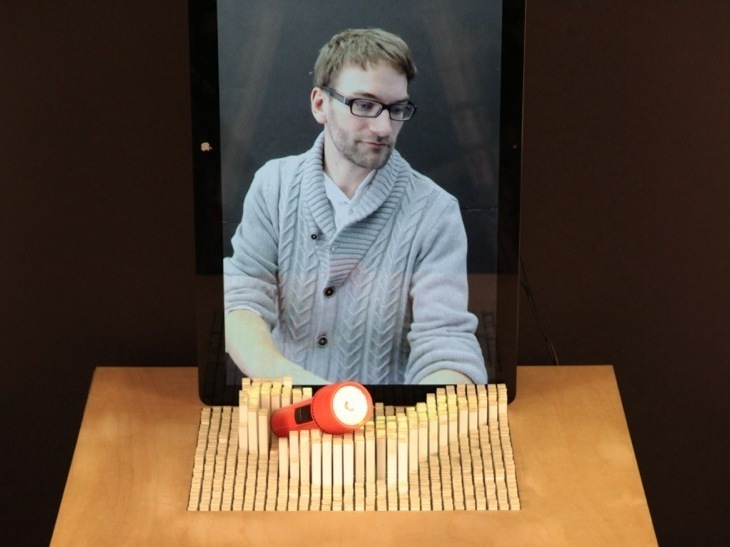 We are also very intrigued by the possibilities of remotely manipulating objects on the table." The MIT Technology Review says that "while it's debatable whether we'll ever be able to teleport objects or people around the world at the speed of light, the inFORM system from Tangible Media Group at MIT might be the seeds of the next best thing." We're imagining a conference call where the people you're talking to look they're in the room. Very Star Trek-ish. But we suspect Two-Way readers may many more thoughts about the technology be used. Serious and fun suggestions are welcome in the comments thread.